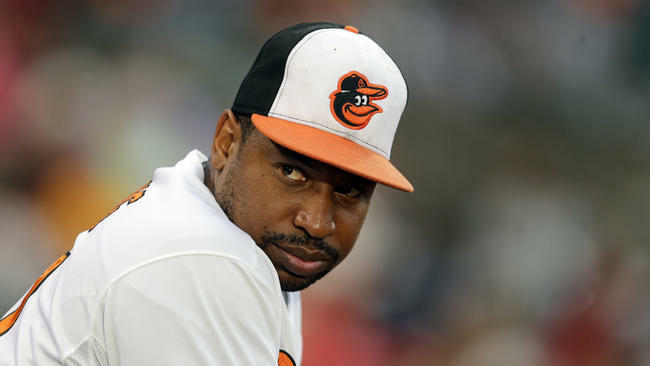 The Baltimore Orioles will attempt to trade Delmon Young after designating the veteran outfielder for assignment, general manager Dan Duquette told the media on Wednesday. The move was made to clear a roster spot for 25-year-old right-handed pitcher Tyler Wilson. Young, who is in his second season with Baltimore after inking a one-year, $2.25 million contract last offseason, has a .270 average with two home runs, 16 RBI and just a .628 OPS in 180 plate appearances this season. In 2014, the right-handed hitting corner outfielder batted .302 with seven home runs and a .779 OPS in 255 plate appearances. Now 29, the former first round selection of Tampa Bay in 2003 still possesses a strong arm but has limited range in the outfield. Young has $1.19 million remaining on his contract through the end of the season. He is set to receive $125,000 bonuses for accumulating 250 and 300 plate appearances, and another $100,000 for every additional 50 plate appearances up to 600. Franchise cornerstone Adam Jones is entrenched in center field for the Orioles. David Lough, Travis Snider and Steve Pearce will share most of the playing time at the corner outfield spots. As for Young, the San Francisco Giants represent a possible trade partner since they have seen Hunter Pence and Nori Aoki recently land on the disabled list. Justin Maxwell (.208 average, .615 OPS) and last year’s post-season hero Travis Ishikawa (who is 0-for-3 in one game) are the primary outfielders beyond Angel Pagan and Gregor Blanco (who is batting .302).